Elsing Hall was built in about 1470 by John Hastings on the site of a much earlier house built by his ancestor, Sir Hugh de Hastings. Little is known of this earlier house built prior to Sir Hugh's death in 1347 but the remains of a gate house and curtain wall on the inner edge of the moat are clearly visible today. Sir Hugh was the younger son of the 2nd Baron Hastings and acquired Elsing by marriage to his mother's ward, Margery Foliot. Sir Hugh de Hastings was the builder of the nearby St Mary's Church, Elsing paid for in part no doubt with the proceeds of his successful campaigning at the Battle of Crecy. Upon his death in 1347 Sir Hugh was buried in the chancel under the largest and most sumptuous medieval brass in England. The brass still exists and draws many visitors to Elsing Church to this day. The estate descended in Sir Hugh's direct male line for seven generations. In 1540 the owner of the house, another Sir Hugh Hastings, died without a male heir. His daughter, Ann, married the son of his old friend, Sir Anthony Browne, Henry VIII's Master of the Horse and owner of Battle Abbey. Elsing hence passed to the Browne family for the next 400 years. The last Browne in the direct line was Thomas who died in 1746. His only daughter spent her widowhood at Elsing from 1770 to 1798 and on her death, being childless, she passed the estate to the local rector, Richard Eaton, who had married a Browne descendant, but required that he adopt the Browne family name and crest. The house passed to his grandson, Richard Charles Browne in 1851. 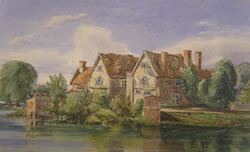 The appearance of the house at that time was recorded in two watercolour paintings by the Rev James Bulwer now held in Norwich's Castle Museum. Prints of the pictures are kept in the house. 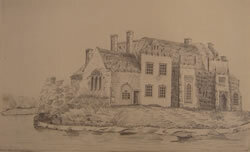 Richard Charles Browne upon inheriting promptly commissioned a very significant renovation of the house. The renovation was undertaken by Thomas Jeckell, a well known Norwich/Cambridge based architect. Thankfully plans for this renovation have survived and are retained in the house. The renovation at that time was very substantial and much of the current look of the house stems from the work carried out then. The ornate spindly “Elizabethan” style chimneys, for example, date from this time as does the magnificent knapped squared flint work on the north face. Jeckell also introduced an abundance of carvings throughout the building including two head-stops on the south front presumably depicting the original Sir Hugh de Hastings and his wife Margery Foliot. In 1893 the house passed to Kate Browne who had become Mrs Clarendon-Hyde by marriage. Her only son tragically died in a shooting accident and the house passed to her two daughters: Miss Clarendon-Hyde and Mrs Margaret Thackeray. On her death the younger of the two, Mrs Thackeray, passed the house to Major George Astley, a nephew of the 21st Baron Hastings, hence bringing the house full circle back to the senior branch of the family from whom it had divided back in the 14th century. Major Astley undertook a fairly substantial modernisation of the house before selling it on the open market for the first time in its history in 1958.